Hamish Macbeth is a comedy-mystery-drama series made by BBC Scotland and first aired in 1995. It is loosely based on a series of mystery novels by M. C. Beaton (Marion Chesney). The series concerns a local police officer, Constable Hamish Macbeth, in the fictitious town of Lochdubh on the west coast of Scotland. The title character was played by Robert Carlyle. It ran for three series from 1995 to 1997, with the first two series having six episodes and the third having eight. The series was released on DVD in the United Kingdom and the United States in 2005 and 2006 respectively, with the exception of the first series episode West Coast Story. This was due to rights issues surrounding the episode's extensive use of excerpts from West Side Story. Hamish Macbeth, a police constable in the Northern Constabulary, accompanied by his dog, a West Highland Terrier named Wee Jock, keeps the peace in the small town of Lochdubh (pronounced with the guttural 'ch' sound, LoCH-DOO). Macbeth does this in his own way, without undue reliance on the letter of the law and with every intention of avoiding being promoted out of what is his ideal job. He strongly dislikes involvement from Inverness police, and sometimes his main work doesn't seem to be the capture of local very petty criminals, but to keep them away from prison and penalties. The major running theme of the series is the tension caused by Hamish's attraction to both the journalist of the local newspaper, Isobel Sutherland (Shirley Henderson) and the aristocratic author Alexandra Maclean (Valerie Gogan). 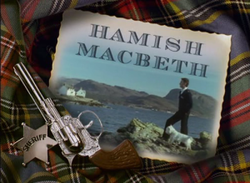 Other themes include the clairvoyance of Hamish's friend and co-worker "TV John", John McIver (Ralph Riach), the not-so-secret romance between the school-teacher Esme Murray and the shopkeeper Rory Campbell, the volatile marriage of the publican Barney Meldrum and his wife Agnes, the schemes of the two Lachie MacCraes, father and son, the laid-back, pipe smoking Doc Brown (Duncan Duff), and Major Peregrine Maclean (David Ashton), father of Alexandra and aristocratic penniless bachelor. The series was accompanied by the Gaelic music of John Lunn. The series was filmed on location in the village of Plockton, the town of Kyle of Lochalsh and the surrounding area. A map of the Lochdubh area shown in the episode "In Search of a Rose" places Lochdubh close to Toscaig, just to the north of Kyle of Lochalsh, with Lochdubh Island being part of the Crowlin Islands. The series was directed mainly by Nicholas Renton, with Mandie Fletcher directing four episodes and Jonas Grimas directing two episodes in 1997. Robert Carlyle as PC Hamish Macbeth; A policeman in the village of Lochdubh, laid-back in dealing with the inhabitants' quirky ways. He works to avoid promotion or transfer, and is clearly more interested in keeping the peace than enforcing the letter of the law. Ralph Riach as John James McIver, AKA "TV John"; Hamish's friend and confidant who got his nickname because he was the first man in Lochdubh to have a television set. He manned the station when Hamish was away and was gifted with the sight. Shirley Henderson as Isobel Sutherland; A reporter on The Lochdubh Listener who is in love with Hamish. Hamish later realises his love for her, but their relationship remains largely unrequited. She temporarily left Lochdubh for a job in Glasgow, but later returns and starts a relationship with Hamish. Valerie Gogan as Alexandra "Alex" Maclean (Series 1—2); Major Maclean's daughter, a novelist who has an on/off relationship with Hamish. She breaks up with Hamish after discovering that he no longer has feelings for her, and is actually in love with Isobel. She then attempts to leave Lochdubh, but falls down a muddy cliff and dies. Barbara Rafferty as Agnes Meldrum; a landlady who runs the local pub with her husband, Barney. It is later revealed that when she was 16, she had a son named Gavin, whom she gave up for adoption. He later reunites with her. Stuart McGugan as Bernard Keir Hardy "Barney" Meldrum; the local publican, an "incomer" from Glasgow. Anne Lacey as Esme Murray; The local teacher and owner of the boarding house. Brian Pettifer as Rory Duncan Campbell; Owner of the local grocery shop, and a very close friend of Esme. Duncan Duff as Dougal Alexander Fleming Brown, AKA "Doc"; The kilt-wearing, pipe-smoking village doctor. Jimmy Yuill/Billy Riddoch as Lachlan McCrae, Sr.; A local schemer who fills his days making unlicensed sausages. Stuart Davids as Lachlan McCrae, Jr; Son of Lachlan Sr., who starts out in the sausage business and ends up the local undertaker. David Ashton as Major Roderick Peregrine ("Roddy") Maclean; Alex's father, local land-owner and former army officer. Zippy as Wee Jock; Hamish's dog. After Wee Jock dies, he is replaced by another dog named simply "Jock". Jon Croft as Malkie Clunie (Series 1); The Major's groundsman and gamekeeper. Mona Bruce as Edith ("Edie") (Series 1); The Major's housekeeper. Dolina MacLennan as Flora (Series 1—2); The secretary and receptionist at the local newspaper office, and prolific knitter. Iain McColl as Neil (Series 2—3); Operator of the local omnibus and the small, unstaffed local railway station. Ronnie Letham as Peter (Series 2—3); Station Officer at the local fire station, which is run by trained locals. Ron Donachie as Zoot McPherrin (Series 1—2); Leader of a hippie colony, with various Lochdubh associations. Laurie Ventry as Reverend Alan Snow (Series 2); Local clergyman of undisclosed denomination. Bill Leadbitter as D.I. Willie Bruce (Series 1); Hamish's superior from the Inverness police force. Alex Norton as Duncan Soutar (Series 1—2); Local farmer. Rab Christie as Jimmy Soutar (Series 1—2); Duncan Soutar's son. Sandy McDade as Jean Foley (Series 3); A friend of Isobel's, who along with her nephew, Frankie, leaves Glasgow to stay in Lochdubh. Stephen Henderson as Frankie Bryce (Series 3); Jean's nephew, who comes with her and Isobel to stay in Lochdubh. Hamish has his hands full dealing with two cases - a salt theft from a local grocery store, and the disappearance of the local wife abuser, Geordie Robb. Hamish is asked to keep the peace when tensions arise as a newcomer, Vicky Jeffreys, tries to teach the villagers about their own "traditional" heritage and takes over events at the Lochdubh day celebrations. Hamish investigates a burglary at Major Maclean's residence, but suspects he is faking the incident to claim the insurance money. However, DI Bruce is determined to catch a gang he suspects are responsible. Hamish sets out to expose the poor dealings of local bank manager Cameron Dicks, who seeks to bankrupt Duncan Soutar. When Hamish's cheques also bounce, he joins the village production of West Side Story. Hamish tries to track down two escaped convicts whom he believes ran over and killed his dog Wee Jock. Suspecting this actions may result in murder, the townsfolk set out to find him before he reaches boiling point. Hamish decides to join a famous tour guide on a mountain trek through the steep Scottish hillsides, suspecting that trouble may arise. When he is led into a dangerous situation, his fears are proven correct. Hamish is branded a devil by a religious group who claim that Lochdubh is the new Gomorrah. His initial disdain turns to concern for head of the Church of the Stony Path, Malachi MacBean, whose behaviour continues to become more erratic. Hamish investigates the disappearance of a local seafarer, Barney Meldon, who recently opened a new visitor attraction - a whale-watching expedition - in the village. Hamish becomes jealous when Isobel breaks a big story with the local newspaper, and finds a new boyfriend, Gary. Hamish's jealously turns to fear when he suspects that Gary may be leading Isobel into the path of some serious trouble. Hamish is ordered to close down a popular local pirate radio station by two radio detection officers, but faces backlash from the locals. Meanwhile, his personal life takes a turn from the worse when he breaks up with Alex, but his decision soon turns into tragedy. Hamish takes off to a remote island following Alex's death, but ends up having to rescue an elderly woman, Belle, who discovers the remains of an unexploded landmine. Meanwhile, Hamish's replacement, PC Duggan, begins to offend the locals. Hamish has to intervene in a family feud, and investigates the disappearance of a body from the local burial ground. Lachie Jr. is asked to become the new assistant to the undertaker, who has become tired of his nephew's behaviour. Hamish is invited to be the best man at the local laird's wedding, but suspects the laird's fiancé may be harbouring an ulterior motive for wanting to marry. Meanwhile, Hamish is forced to train a new woman police constable, Anne Patterson. Hamish investigates a twenty-year-old mystery which has divided the island of Lagga-Laggas, whilst trying to avoid becoming embroiled in the rivalry between Father McPhail and his adversary, Enoch McDuff. Hamish must protect the village from a gang of ruthless villains who follow Isobel back from Glasgow, but he has a particularly difficult time keeping them under control - as they have yet to commit a crime. Hamish has to uncover the secret of Frankie's best friend from Glasgow, Tusker Gray, who threatens to ruin the annual singing contest between Lochdubh Stag Bar and the Dunbracken Arms. Hamish investigates a fire at the local primary school, which destroys part of the building. Esme is shocked when the council decide not to rebuild, but is even more disgusted when she discovers her boyfriend Rory may be connected. Hamish suspects that there may be cheating at the annual shinty match against Dunbracken, but the relationship breakdown between Lachie Jr. and his father threatens to overshadow the entire game. Hamish is forced to uncover the location of the Stone of Destiny after John's criminal brother, Kenneth McIver, is sprung from an American jail, and returns to Lochdubh in search of the priceless artifact. Hamish and friends trek across the mountains to rescue John after Ava and Kenneth manage to steal the Stone of Destiny. But while Hamish and Isobel's relationship begins to blossom, John's fate proves to be much darker. This page was last edited on 26 March 2019, at 09:24 (UTC).